2e Creative in Saint Louis, Missouri, took home an armful of 2014 Hermes Creative Awards and AVA Digital Awards, one of which was for the company’s pro bono poster campaign for ARTS San Antonio. We recently caught up with 2e account coordinator Mike Ferrell to learn more about the project and how the 2e Creative team used its skills to create a positive impact. To start off, what is ARTS San Antonio and what is its mission? 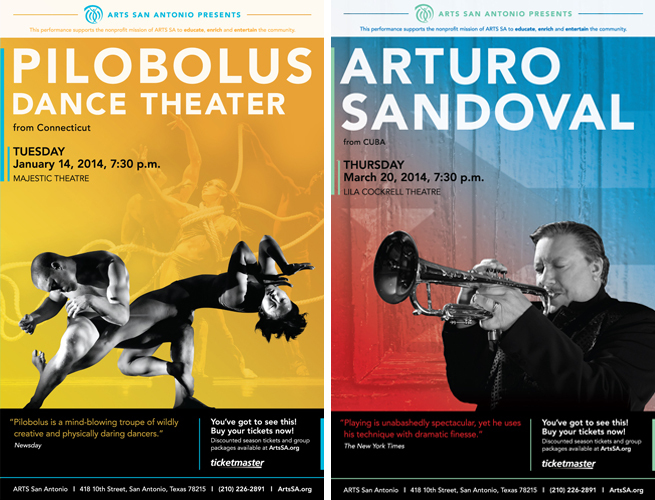 In brief, ARTS San Antonio is a nonprofit organization that focuses on the performing arts. Their mission is to “educate, enrich and entertain the people,” and they do so by continuously striving to deliver exceptional performing and visual arts to the greater San Antonio region. The result: globally significant artists and cultural experiences that give San Antonians the ability to directly and powerfully engage. Tell me how 2e Creative got involved with ARTS San Antonio. Why did 2e decide to take on the project pro bono? It’s in our blood — literally. John Toohey, president and executive director of ARTS SA, is the brother of Joe Toohey, our company’s founder, and father of Ross Toohey, our company’s principal. But regardless of the family connection, it was a project that our entire team was excited about. As an agency, 2e focuses on working with organizations that create positive impact. Traditionally, this has meant a lot of our partnerships have centered in the healthcare and biotech spaces — working with researchers, physicians, engineers and other innovators. ARTS San Antonio was a fantastic opportunity for us, because it allowed us to remain true to our company’s spirit while stretching our legs beyond the typical realms in which we work. We recognized very quickly that ARTS San Antonio delivers real value and impact to its community through culture and art — and they do so while having to wrestle with the financial challenges that many nonprofits face. Doing it pro bono was a no brainer to us. Walk me through the design process. Did your design team turn somewhere for inspiration, or was there a concrete vision from the start? The process started with the collection of all information and assets ARTS SA had for the season’s upcoming performances. In true 2e fashion, we also did our own research — in hindsight, probably far more than necessary — to learn as much as we could about each performance and the message behind it. Since this is the second year we’ve created the identity for ARTS’ series of performances, we had a good idea of what the target audience wanted to see. Our vision was to highlight photography that was specific to each performance. However, one of the challenges to this approach was the fact that we couldn’t necessarily control the images for each show; in other words, we couldn’t guarantee photographic consistency from show-to-show. As a result, we knew the concepts would have to be accommodating to a wide spectrum of photographic styles and qualities. We developed three concepts for ARTS SA, and the chosen concept featured photography front and center. To solve any inconsistencies, the concept relied on manipulating the photos in a way that still created a unifying style that could then be extended throughout the entire series of posters. The bright colors are used to convey both the nature of the performances as well as the spirit and energy of the organization. Finding a visually compelling solution that could effectively utilize the images provided was difficult. Some images were shot in a studio; some were from the performance itself; others had portions blurred out due to the motions of the performer. Trying to accommodate all the necessary performance information and sponsor logos was also a challenge. How was the design received by ARTS San Antonio and its target audience? 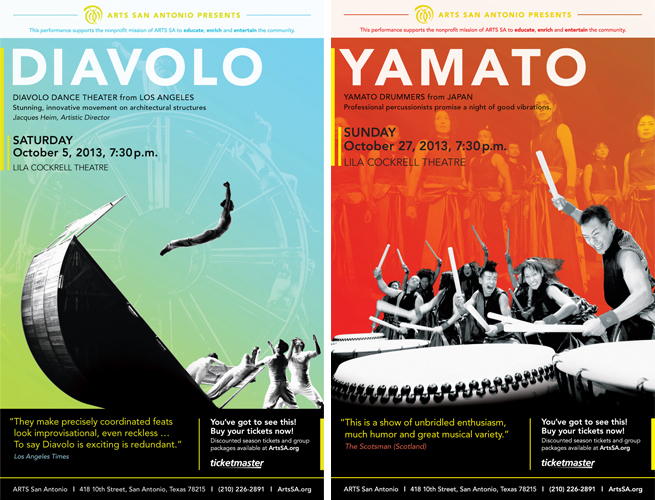 ARTS San Antonio have been very pleased with the posters because they are bold and energetic. This style has helped convey a message of confidence to their audience, ensuring them that ARTS SA is successful, healthy and strong. A creative director, an art director and our design intern at the time worked together to create the initial three concepts. After the concept was chosen, our production manager and art director worked together to roll out one poster every month (per the ARTS SA Performance Schedule). An account coordinator helped throughout the entire process to maintain communication with the client. 2e Creative is a brand communications agency that utilizes logic and creativity to forge engagement marketing ecosystems that generate interest and harvest intent. In other words, we take complex value propositions and translate them into engaging brand stories that make you move, think and feel.